The Incantations of Daniel Johnston, the stunning graphic novel collaboration by writer Scott McClanahan and artist Ricardo Cavolo, is, like Johnston himself, spirited and dark and sweet and sad. It’s a biography that spans Johnston’s long career and unlikely fame. It’s also a meditation on what it means to create, how we leave our mark in this world, and how the experience of art makes us feel less alone. “There is nothing more amazing than the bedrooms of our childhoods,” McClanahan writes in the book. “[Johnston] didn’t need cool and he didn’t need the faraway cities. He only needed his own bedroom. He made it the factory of his mind.” McClanahan lives in Beckley, West Virginia and he’s suspicious of the traditional publishing scene. “It seems like writers are more interested in agents and book contracts than in writing,” he said. “A good chunk of writers write books because some big publisher gave them a contract to write them. They write books because they consider themselves writers. It seems like a trap if you ask me. We keep having these conversations about inclusivity in publishing, but isn’t it the job of the artist not to be included?” McClanahan said. Johnston, who suffers from debilitating mental illness, knows more than most how it feels to be on the outside of things. For all of the accolades and adoration those in the music industry have bestowed upon him, there is often an undercurrent of pity at work—like he’s a helpless pet cause. It would be dishonest not to include the specifics of Johnston’s struggles in his biography: that he lives with his parents, that he’s suffered from several psychotic breaks, that he’s highly medicated and unable to hold down a job. “The mental health thing is not the interesting part of Johnston for me,” McClanahan said. “I’m more interested in Daniel Johnston because he seems like an Internet artist 30 years too early…But I guess it’s like my friend ‘Pringles’ from school. We were friends with this kid and then one day in 8th grade he brought a Pringles backpack to school. It was like the type of crap you get by cutting the proofs of purchase off Pringles Potato Chips…So he brings in this backpack and we immediately start calling him ‘Pringles.’ It became his nickname, but to a certain extent it became his name. That’s the way the world works I guess. That’s the way we see people.” Still, Incantations manages to deal with Johnston’s artistic approach in a way that transcends his circumstances—there’s a magical swerve near the end of the book, a moment where the art and the narrative coalesce in a completely unexpected way. The three artists responsible for this book all went at it alone: Johnston, troubled and isolated, generating a magnificent body of work to keep himself company; McClanahan and Cavolo, collaborating from different countries, in different mediums, never once meeting face to face. 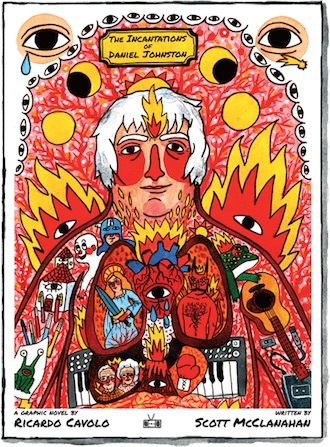 But reading The Incantations of Daniel Johnston makes the reader feel less alone, makes us feel connected to the vivid beauty and torment that underpins the human experience. “There’s always a danger in sharing private work,” McClanahan said. “You start making things because of the expectation of making things.” But McClanahan and Cavolo have managed to generate something spectacular and inclusive from their sequestered corners. And I’m so very glad they’ve decided to share it with the rest of us.